Every year I hope, in vain, that statistics about book reviewing (e.g. Vida Count, Stella Count) will show there is no longer a gender imbalance in favour of male writers—although I was delighted to see that the 2013 Stella Count listed the daily newspaper of my own state, The West Australian, as one of only two exceptions among major Australian publications (the other being the industry-based Books+Publishing). A big shout-out to the West’s Books Editor, William Yeoman! It was, in part, because of statistics like these that Elizabeth Lhuede established the Australian Women Writers Challenge in 2012 (you can read more about that here), and I am signing up for my third year as a challenge participant. This year I’m nominating my own terms for the challenge—that is, rather than sign up for set minimum numbers of books to read and books to review, I’m committing myself to improving my 2014 result (21 read and 3 reviewed). At the top of my to-be-read pile are books associated with sessions I’ll be chairing at the Perth Writers Festival next month, and the one I’m currently reading is Diana Sweeney’s brilliant debut, The Minnow, which won the 2013 Text Prize for Young Adult and Children’s Writing. 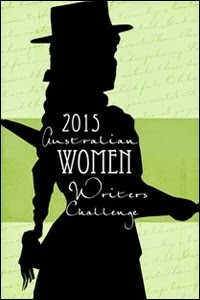 If you’re interested in supporting Australian women writers by joining the 2015 challenge, it’s easy: details here. You can participate as a reader/reviewer or just as a reader—and even if you don’t have a blog, you can take part by linking your Goodreads reviews to the challenge. Thanks, Amanda. I didn’t realise the WA had a good record when it comes to gender balance in reviewing. You have such a great bunch of women writers – many of whom have been read and reviewed for the challenge. So glad you’re joining the challenge again this year. I look forward to reading your reviews and hearing more via social media about what you’re reading. Will you be doing a write-up of the Perth festival? I just signed up, Amanda, and will be posting reviews at http://lauriesteed.com/thegumwall. Thanks for the post! Yes, it’s my first year! I’m looking forward to it. Well, Rashida Murphy, Karen McCrea and Louise Allen have been egging me on. Now your post has just tipped the balance. I’m going to sign up!